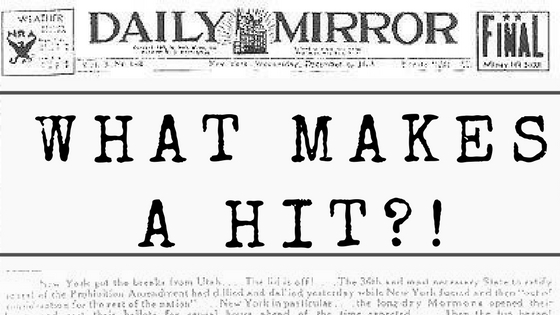 George and Ira Gershwin wrote countless songs, but few are quite as iconic as “’S Wonderful.” In today’s installment of “What Makes a Hit,” we will explore how Ira’s use of American slang ensured this tune’s enduring popularity. “’S Wonderful” made its debut in the musical Funny Face, which opened at the Alvin Theater on Broadway on November 22, 1927, and ran for 244 performances. The successful show was actually based on a failed Gershwin musical titled Smarty, which opened in out-of-town previews in 1927 and was promptly canceled due to bad reviews. Both Smarty and Funny Face featured the brother-sister duo Fred and Adele Astaire. Their casting and just four songs—including “’S Wonderful”—were the only aspects retained when Smarty reopened as Funny Face following a month of revisions. “’S Wonderful” was later sung by Fred in the musical’s 1957 film adaptation co-starring Audrey Hepburn. Although Ira’s masterful lyrics are the subject of this post, let’s first take a brief look at George’s music. In his book The Gershwin Style, Wayne Schneider writes, “Of all [George] Gershwin’s songs, none is more transparent and skeletal than ‘’S Wonderful’.” Schneider is specifically referring to George’s “bare-boned” music; the melody doesn’t stray beyond an octave, and the music features a multitude of repeated phrases and rests. The simple tune is memorable and was later reinterpreted by many different artists, two key marks of a hit song. The sweet, lilting tone of the melody, paired with the universally relatable romantic lyrics, appealed to both artists and audiences alike. George first wrote a charming melody, but Ira’s lyrics made this tune a hit. (That) You should care for me! ’S awful nice! ’S paradise! ’S what I love to see! In Lyrics on Several Occasions, Ira recalled that, “the principal reason for writing this lyric was to feature the sibilant sound effect by deleting the ‘it’ of ‘it’s’ and slurring the leftover ‘s’ with the first syllable of the following word.” The phrase “it’s wonderful” isn’t usually pronounced as formally as it is written; rather, the first word is elided into the second. Ira used this appealing colloquialism to great effect in “’S Wonderful,” de-formalizing his lyrics to grab the attention of listeners. When it came to “’S Wonderful,” Ira had just one complaint: “I’m frequently baffled by what some singers have in mind and throat when they formalize the phrases to ‘It’s wonderful,’ ‘It’s marvelous,’ ‘It’s Paradise’…”. It’s no wonder Ira objected when performers formalized the words he worked so intentionally to elide, capturing the peculiarities of American colloquial speech. In addition to notable performances of “’S Wonderful” on screen and stage, including the 2015 Broadway musical An American in Paris, this charming song has crossed genres and been covered by many different artists. Ted Gioia notes that, “few Gershwin songs have shown themselves so capable of reinvention.” Frank Sinatra put a Rat Pack spin on the melody while João Gilberto gave it a bossa nova feel. Even though the song was written for a Broadway musical, artists have been able to perform “’S Wonderful” in strikingly different contexts and make it their own. George’s simple melody and Ira’s unique lyrics allowed for both reproducibility and memorability. The combination of the two made for a “’S Marvelous” hit! Furia, Philip. Ira Gershwin: The Art of the Lyricist. New York and Oxford: Oxford University Press, 1996. Gershwin, Ira. Lyrics on Several Occasions. New York: Limelight Editions, 1959. Gioia, Ted. Jazz Standards: A Guide to the Repertoire. New York: Oxford University Press, 2012. Schneider, Wayne, ed. The Gershwin Style: New Looks at the Music of George Gershwin. New York: Oxford University Press, 1999. I am looking for an alternate? verse for the song “Mine” by Gershwin. I am adding lyrics to the Ampico piano roll which was issued in 1933. There is a spot on the roll after the first refrain which is begging for lyrics, but I cannot find anything that will fit in. Was “Mine” issued as a single song and then added to the movie “Let ‘Em Eat Cake”. The second refrain includes the “Patter”, so it isn’t that and it isn’t the comments made at the beginning of the song. Any thoughts? Thanks very much! Michael, thanks for your question! You might check out Ira’s book of lyrics for the alternate verse, or Robert Kimball’s “The Complete Lyrics of Ira Gershwin.” Both are great resources of lyrics and could be helpful here. It’s also possible that there’s material about the song at the Library of Congress, since it was added to “Let ‘Em Eat Cake.” We would have to ask someone to check for us, so let us know if the first two sources don’t turn up what you’re looking for!